to work with my best friend Alexa. Master: Alexa, please turn off the light. Alexa: Okay. Shut up your mouth, Mr. Smart Plug. Please install the manufacture APP "Annhome" first. The APP is FREE! You can download it from Apple Store / Google Play or through scanning two-dimensional code in the USER MANUAL. Press and hold the ON/OFF button for about 5 seconds to activate Wi-Fi hotspot. Then you can connect the smart socket to the APP after the LED flickering red light. Three AC outputs can be controlled by APP separately and support up to 3 electronic equipment at the same time. Support timer & countdown function. Through the APP installed in your phone, you can individually schedule timer and countdown setting for the 3 outlets anytime & anywhere. You can separately turn on/off the 3 outputs by issuing voice commands to Alexa or Google assistant. 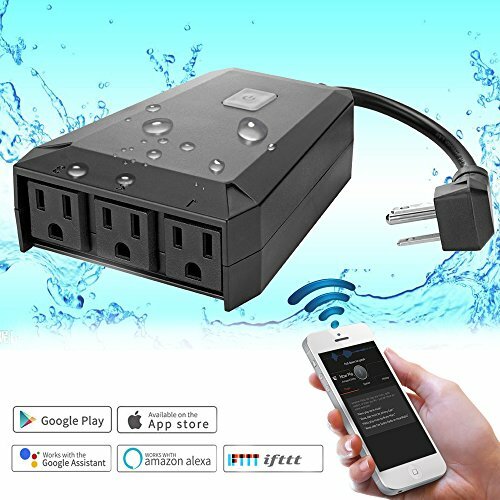 The smart socket complies with protection class IP44 against water splashing, which is perfect for outdoor as well as indoor use. But NOT for water immersion.